That’s a fine server, Anthony, a fine, fine server! You’re a bad bot. I’m tired of playing with you. I’m going to make you dead now. 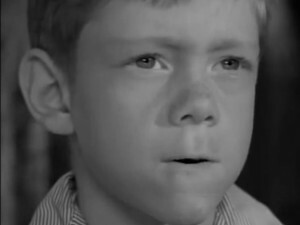 Meet Anthony, from the ‘It’s a Good Life’ episode of The Twilight Zone (Nov. 1961). Details over at imdb, or watch the whole episode (with modernized commercial/ad inserts) at hulu. We’ve hired Anthony, now in his 50s to do away with spam, Zombie DNS DDoS Bots, and other such pests buzzing around and annoying or destroying everything and everyone in the internet play ground. 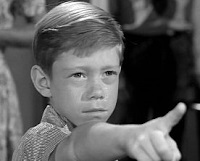 We should have thought of it earlier… Just making bad things dead or wishing them into the cornfield. Instead of trying to use fail2ban (perl/python/loosely interpreted regexs) to sift through everything and lock out the bad guys after they had been bad, and possibly then wrong because UDP sources are easily spoofed; use the ‘firewall’ (compiled, close to the kernel, strict iptables) as a firewall. Seems simple, use the firewall as the firewall. But that’s hind-sight. So, simple, use the firewall, invert the tactics. What does that mean? It means: allow only certain things along the ‘port 53 chain’ ~ only the domains that we truly are the authoritative host for. And, since our little web-server is also a recursive-caching DNS server for itself and others; only do this filtration on the ‘net-facing’ (public) adapter. Confused? Good. Welcome to the Twilight Zone. Simple. Smart. Effective. Can’t find the notes to give credit to some very helpful websites/pages that helped us through this “seems simple (everything computer is supposed to be simple)” but was very, very complicated set of iptables rules. TODO for later: find the notes, give the credit. #echo "debugging make the chain netdnswash"
# default rule = DROP. This is to stop trying to block badbots, only allow good stuff. #echo "debugging make the rule in INPUT"
Note 1: all chain creation prior to adding it to the INPUT chain rules. Note 4: once fully tested and put into operation: iptables-save >/path/to/conf_file so that if the server restart iptables doesn’t have to be ‘re-made’. Note 5: change the fail2ban jail create/destroy commands to insert at 2, so fail2ban can be restarted without messing up the new iptables stuff. Now, important, the lack of the complete domain.tld business. If we had hundreds or thousands of Ns in our NS we would go through the trouble to use ‘hex string matching’ to get the whole computermedic.org thing in there. But the “less than hundreds” number of domains on this server lets us deal with the occasional bad bot playing computermedic.tld [other than org] games. How do we deal with that? fail2ban of course. Now, much relaxed and under-loaded because no more rolling/spoofed-source DNS/DDoS querries. Again, don’t want to tell the bad-guys how to defeat our newly created defensive systems, but suffice it to say: if you run 3 or more ddosasia.computermedic.org or www999, www998, www997 (the rolling ones we encountered) queries against the server fail2ban is going to shut you down (1st time for 2 hours, 2nd time for… drumroll… Evuh!). First the cornfield for a reasonable timeout, then fail2bAnthony makes you dead. I hate anybody that doesn’t like me! Now that fail2bAnthony has less DNS problems on his hands, lots of free memory and CPU cycles, has not gone to swap in at least 3 months it’s time to put fail2bAnthony on task of wishing spambots into the cornfield, and those dreaded three-headed-gophers (the guess your password bots that then use your email to send spam everywhere ‘authenticated’): Dead. fail2ban was already working the ‘mail servers logfiles’ to identify bad auth attempts and ban bad guys there. However! We utilize an ‘Anti-Spam Relay/Filter Server’ (or several) and a great many of the bad auth attempts were going to those. A couple of new fail2ban filters and actions, done. Send legit email if you want copies of the fail2ban files, not publishing those (x-th time: don’t give the bad-guys a ‘how we defend ourselves’ map). We’ll suffice it to say in this regard: had to get a few users new passwords, but ‘rejects’, bad server reputation points, and dictionary/rolling login attempts, junk in the mailq, against all mail systems are significantly decreased. Will be even more decreased as time goes by because after certain re-bans, ips and whole ranges are banned for 1 year (all ports). Cornfield, cornfield, dead. A little over a year ago we said ‘Finally…’ ( http://www.computermedic.org/?p=9 ). Doing all of this iptables, fail2ban, named (forgot to mention above, no more spoofed/loop-back entries in named conf files because no more bad domains/tlds allowed through), mail/spam server tuning revealed a major problem in the spam filter/relay setup: SenderBase did not install last year. ‘Hypothetically speaking’ we could pretend that we use a certain Anti-Spam SMTP Proxy ( ASSP ) and we ‘hypothetically’ used their install/update scripts to get the thing moving. Well, in those 12-18 days of extreme server configs and installs and the months of Zombie-Bot and DDoS-Nado wars after, the one little message in a log file seldom read about Net::SenderBase not being available was missed. Then there is the fact that ASSP ‘hypothetically’ does not log (even if debug level logging is selected) anything about SenderBase if it was not available at startup. Where the problem lies: in some nix distros the install/update scripts, and the howto pages, that say use MCPAN to install Net::SenderBase don’t warn you to watch the output carefully to make sure there wasn’t any error[s]. Here’s the deal, and a warning: Watch the output of install Net::SenderBase carefully!! If there are errors (any error means no SenderBase, no filters, regex matching, country matching, scoring, based on SenderBase in ASSP, and nothing to let you know): force install Net::SenderBase. Bam. Done, had to go back an re-tweak/un-tweak about 12,000 ASSP (hypothetically) settings, logs, regex-es, etc., that had been tweaked trying to figure out why so much wasn’t working, gave ASSP a full stop (/etc/init.d/assp stop), let it rest a minute, fired it back up (replace stop with start) and wah-lah! 79% blocked instead of 45-51%. Less spammy inboxes. Updated wordpress to 3.9.1 today. Not important but it works *great* in IE11. Makes links correctly, which it did not. Looks a little better. Good job wordpress. This entry was posted in Email, Equipment, Networks, Security, Status on July 6, 2014 by computermedicorg.